Well, where there is freedom doubt itself must be free. The spectacle of a great, solvent government paying a fictitious price for gold it did not want and did not need and doing it on purpose to debase the value of its own paper currency was one to astonish the world. To the revolutionary mind the American vista must have been almost as incredible as Genghis Khan’s first view of China – so rich, so soft, so unaware. The New Deal’s enmity for that system of free and competitive private enterprise which we call capitalism was fundamental. It is the function of the President, representing the executive principle, to execute the laws. Revolution in the modern case is no longer an uncouth business. If you put a ten dollar bill under the rug instead of spending it, that is capital formation. It represents ten dollars’ worth of something that might have been immediately consumed, but wasn’t. Lenin, the greatest theorist of them all, did not know what he was going to do after he had got the power. There was endless controversy as to whether the acts of the New Deal did actually move recovery or retard it, and nothing final could ever come of that bitter debate because it is forever impossible to prove what might have happened in place of what did. Garet Garrett was born in Pana, Illinois, United States. He was an American journalist and author, who is noted for his opposition to the New Deal and U.S. involvement in the Second World War. He had a financial columnist for the New York Evening Post in 1910. In 1913, he became editor of The New York Times Annalist, a new financial weekly, and, in 1915, he joined the editorial council of the New York Times. In 1916, at 38, he became the executive editor of the New York Tribune. 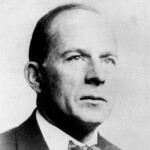 In 1922, he became the principal writer on economic issues for the Saturday Evening Post, a position he held until 1942. He wrote several books include: Where the money grows, The blue wound, The Driver(novel), The cinder buggy, Harangue, A bubble that broke the world, The wild wheel, and The People's Pottage.